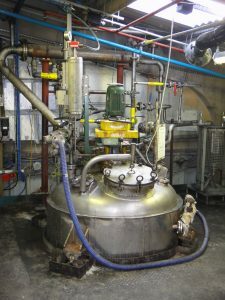 Witton has numerous stainless steel reactors ranging from the small scale 50 litres up to 18,000 litres for larger scale processes. Each vessel has steam heated jackets capable of temperatures up to 150°C. All are fitted with condensers to allow reactions to be run at reflux or set up for distillation if stripping is required. Our reactors are cooled using water from one of three on site cooling towers. All the reactors are vented via scrubbers and each can be inserted with 99.8% nitrogen generated on site. Witton has experience in handling a wide range of materials from corrosive, flammable and viscous materials. Our equipment is capable of handling polymers with viscosities in excess of 100,000cps. All our plant is compliant with current DSEAR regulations. Many of the reactors can be linked to allow easy transfer between vessels for multi-stage processes. With two large centrifuges available it is easy to connect any one of the vessels to a centrifuge for the isolation or removal of solids from slurries. Material from the reactors can be packed as required into bulk tankers, IBC, drums or kegs. If required material can be transferred to onsite storage for collection as required.